Exeter was the major religious centre for the southwest peninsula of England throughout the Middle Ages, especially after the cathedral was established at the city in 1050. Apart from the cathedral itself, crammed within the 93 acres bounded by the city walls were a Dominican Friary, a Franciscan Friary, a Benedictine Priory, approximately 33 churches and chapels, a large number of almshouses, a College for the Annuellars, a College for the Vicars Choral, a sprawling Bishop's Palace, a Chantry for the Precentor, a Deanery, as well as large individual houses belonging to the Archdeacon of Exeter and the cathedral's canons, treasurer and chancellor. In addition to these there were individual townhouses used by the archdeacons of Totnes and Barnstaple, the Archdeacons of Exeter, the Archdeacons of Cornwall, the Priors of Plympton Priory, the many Abbots of Torre Abbey, Dunkeswell Abbey, Hartland Abbey, Newenham Abbey and the very wealthy Abbots of Tavistock Abbey. Another property was owned by the Abbots of Buckfast Abbey and this became known as the Abbot's Lodge. Despite its name it seems unlikely that the Abbots of Buckfast ever used the property on a regular basis. It is cited as belonging to the abbots in a document from 1431, but Lega-Weekes remarks that "one seldom meets with any reference to Abbots of Buckfast in Exeter local records". It seems much more likely that the property was let by the abbey to various members of the clergy associated with Exeter Cathedral. During the Dissolution of the Monasteries the Benedictine Abbey at Buckfast, some 20 miles from Exeter, was closed on 25 February 1539 and the Abbot's Lodge at Exeter fell into the hands of the crown. In 1545 it was granted by Henry VIII to George Rolle, a Tudor lawyer. It was at the Abbot's Lodge that the Grand Duke of Tuscany was entertained by Sir John Rolle in 1669 and it remained in the Rolle family until 1737 when it was sold to the Rev. John Heskett. In 1775 it was purchased by James Rodd and eventually became the property of the Ecclesiastical Commissioners in 1862. By 1942 it was the house of the headmaster of the Choristers' School, which was joined to the west side of the building and stood on part of the residence of the Archdeacon of Totnes. Unfortunately, architectural information about the building is scarce. In the 15th century at least it was approached through a gatehouse. Lying between the gatehouse and the lodge itself was a large courtyard. The aerial photograph above right c1930 shows part of the Cathedral Close, the Abbot's Lodge and its medieval gatehouse highlighted in red. 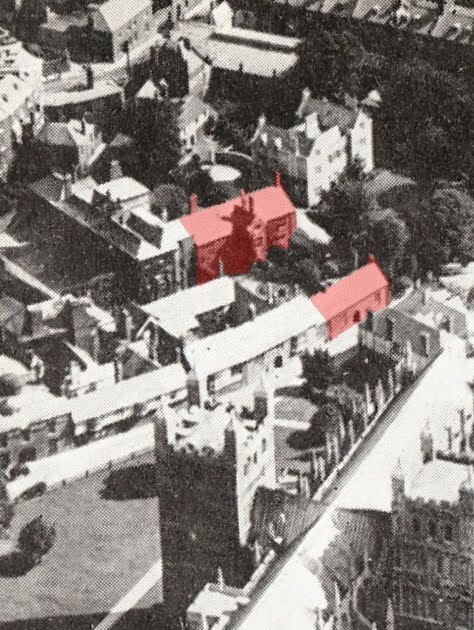 To the left of the Abbot's Lodge, built at a right-angle to the Lodge and stretching back to Egypt Lane is the Choristers' School. 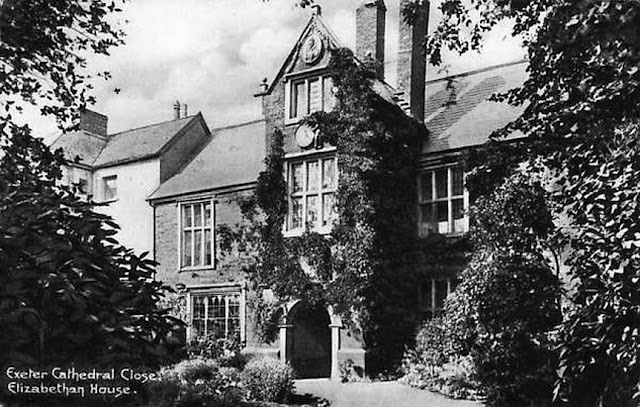 The gatehouse remains today as No. 11, Cathedral Close, superbly reconstructed after its total destruction in 1942. Although Elizabethan in appearance, much of the Abbot's Lodge probably dated to the 15th century. The property would've undergone some modifications in the mid-16th century under George Rolle and it seems that a further series of alterations were carried out at the beginning of the 17th century, including the addition of the large stone mullion windows in the rebuilt facade of the south-facing range and the addition of the imposing three-tier porch. In the 17th century the principal apartment was on the first floor, possibly the site of the medieval hall which had been divided horizontally into two rooms. This apartment had a lofty plasterwork semi-octagonal ceiling that was altered c1878. At either end of the room, in the spandrels above the springing of the roof, were three plasterwork heraldic decorations which depicted the coats of arms of various local families as well as a fourth depicting the Royal arms of Elizabeth I. An edition of the 'Devon and Cornwall Notes and and Queries' from 1917 fortunately identified the coats of arms and supplied accompanying photographs. 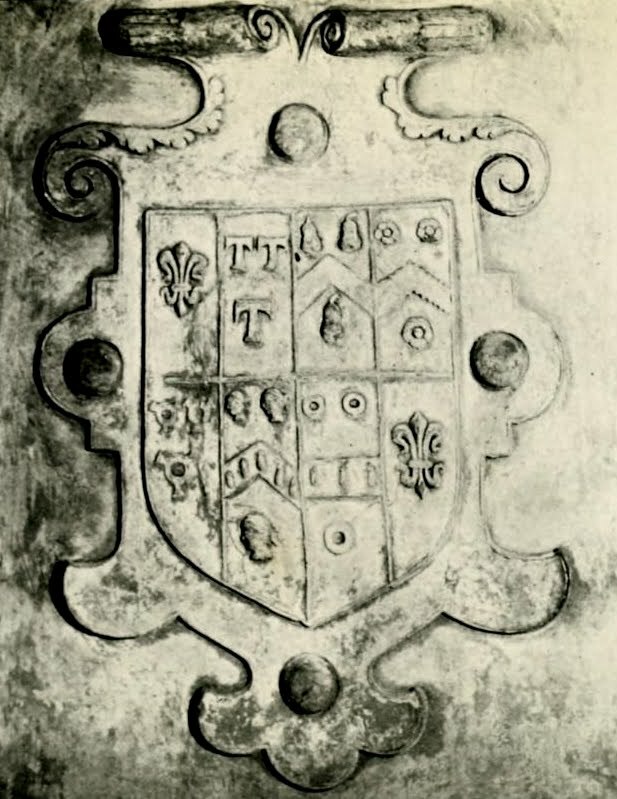 The first coat of arms related to the Rolle family above left, the Tudor owners of the building. 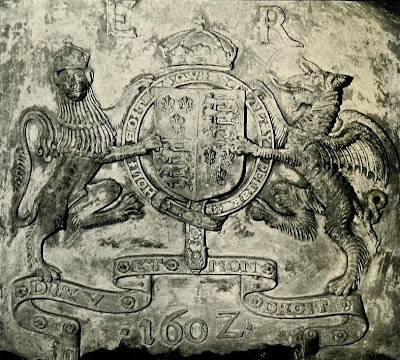 The Rolle device is on the left: three lions rampant with three bezants, symbolising gold coins. Sir Henry Rolle married Elizabeth Watts during the reign of Elizabeth I, and the Watts family are represented with eagles heads and crosses. Other devices include three mermaids, a lion rampant and three swans. 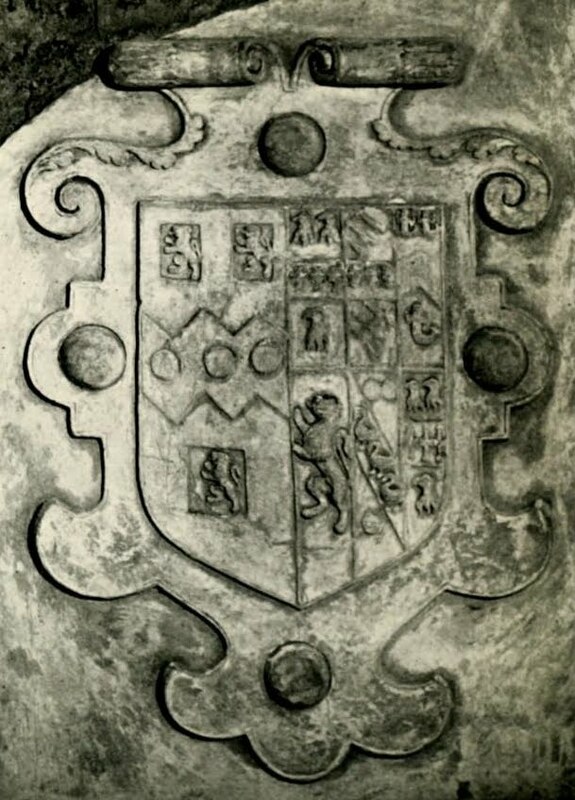 The second, and very complex, coat of arms right related to the Portman family and is quartered into eight. It consists of the following arms: the fleur de lis of Portman quartered with three tau crosses of the Crosse family of Somerset. This records the 15th century marriage of William Portman to Alice Crosse. One of their sons, Walter Portman, married Christina Orchard in 1450 (and their names are still be to found in the Somerset village of Portman Orchard, to which manor Christina was heir). The Orchard family are represented by the three little pears divided by a chevron. The three roses, also divided by a chevron, are the heraldic device of the Gilbert family. William Portman, a descendant of Walter and Christina, married Elizabeth, the daughter of John Gilbert. Knighted by Edward VI, Sir William Portman rose to become Lord Chief Justice of the King's Bench and was one of the administrators of Catherine of Aragon's Will after her death in 1536. The three trivets recall a marriage between William Orchard and a daughter of Thomas Trevett. The three moors heads and the three rings, or annulets, also probably relate to the Gilbert family. 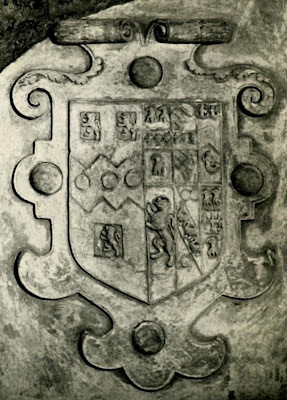 The third coat of arms was the simply the Rolle lions rampant and bezants with the arms of Sir Henry Rolle's second wife, Joan Fortescue. In the centre of the west wall of the apartment, also executed in plaster, was a large shield emblazoned with a magnificent depiction of the Royal arms of Elizabeth I above left: the lion rampant of England on the left with a dragon, representing Wales on the right. 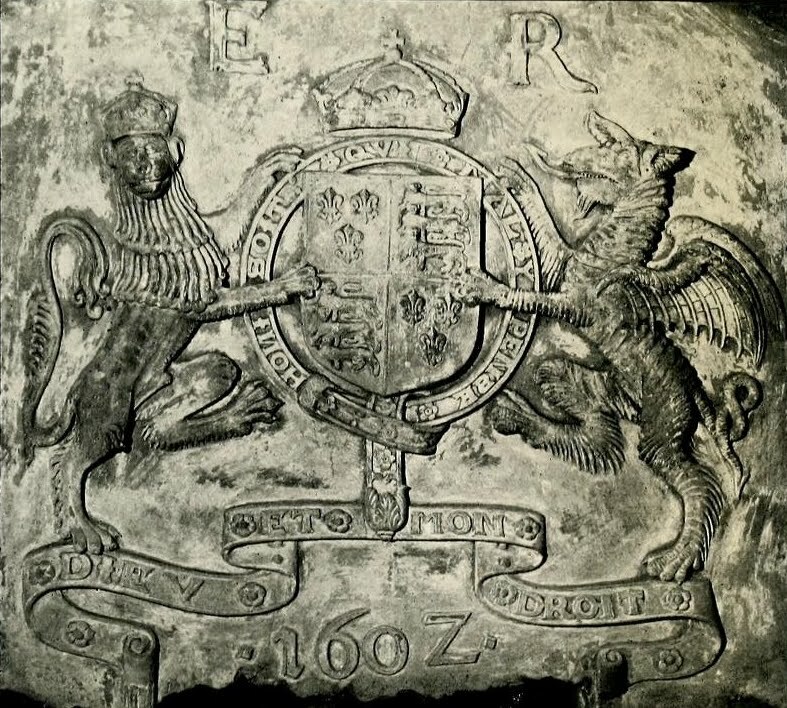 Held between their claws were the three lions of England quartered with the fleur de lis of France around which ran the motto of Edward III's Order of the Garter: Honi Soit Qui Mal Y Pense. Underneath this ran the motto of the English monarchy, used since the time of Henry V: Dieu et Mon Droit, the words separated by little Tudor roses. At the bottom is the date 1602, just a year before Elizabeth I died in March 1603, and the date when the plasterwork was probably installed by then owner, Sir Henry Rolle. On one side of the Royal arms was a Tudor rose, surmounted by a crown. On the other side was a fleur de lis, springing from a bed of lily leaves, also surmounted by a crown. The fleur de lis was a stylised form of a French lily and was used to represent the English monarchy's belief that it had a claim to the French throne. As far as I know, these photographs of the plasterwork decoration are the only images showing anything of the interior of the Abbot's Lodge and that alone makes them both important and interesting. There were also some notable details on the three-storey porch. Immediately above the arched entrance was a carved representation of the coat of arms of the Rodd family impaling the arms of Raynor, as well as Rodd's motto: Vincit Veritas. Above this was a sundial and at the top, set into the eave of the porch, was a large stone medallion carved with a relief sculpture of Elizabeth I. The presence of the Rodd coat of arms strongly suggests that all of these features were added to the porch by John Rodd at the end of the 18th century. 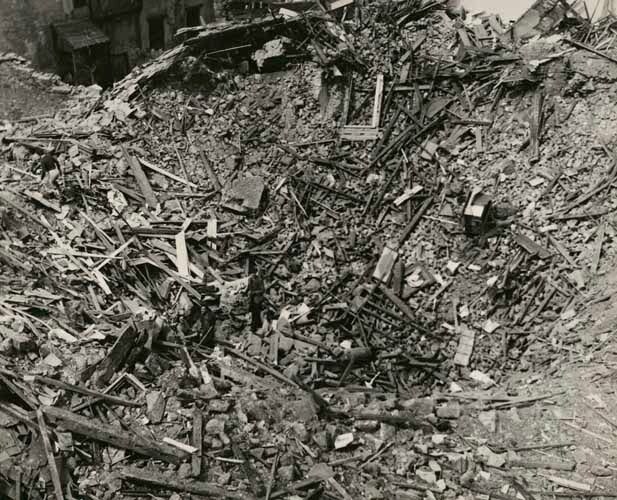 On 04 May 1942 Exeter suffered a heavy air-raid as part of the notorious Baedeker Blitz and the Abbot's Lodge received a direct hit from a high-explosive bomb. Four people in the building at the time were killed and the Abbot's Lodge, including the decorative plasterwork, was totally destroyed. (The Choristers' School was also destroyed during the same raid as was the Lodge's 15th century gatehouse, although the gatehouse was reconstructed after the war.) At daybreak there was nothing left of the Abbot's Lodge except a deep crater below © Express & Echo, and today there is no evidence above-ground that the property ever existed. "Exeter is the Jewel of the West, and We Have Destroyed It"
Isca Dumnoniorum: A Prehistoric Settlement? I have attributed the Copyright holder on all images when known. If any Copyright holders wish to have their Copyright image removed then please contact me.